When flipping through players' cards, it seemed important to figure out who was destined to go straight to the commons box - without a care for cards of players who may deserve a second look. Over the last five years, I've been more exposed to the sentiment there is more ways to view players besides saying whether a guy is a star or a scrub - it is interesting to redefine my perceptions of players as part of understanding the game more as a fan. The rank-and-file guys - are basically the so-called common players who fill up a 25-man roster. Often serviceable and competent in spurts, as great as these players are for reaching the Major Leagues, often they are expendable and always have to re-invent themselves in order to stick around for a prolonged period of time. Often you have to root for these guys, because for the most part, they offer the illusion of being the every day guy who just happened to work hard enough to reach his goals. With the Los Angeles Angels pitching staff hurting, I wouldn't mind it if this guy was given an opportunity to fill in - while John Lackey and Ervin Santana recover. Of course Pedro's hitting is the least of anyone's concerns, but if he can make 20-25 starts for a team - I think it would be a pleasant surprise. He may not be the Pedro of 1999, but any contributions from this pitching legend will be welcomed. There is some grumblings Pedro wants 'John Smoltz' money - which is about $5 million for 2009. If I was a general manager I'd probably offers Pedro around $3 million plus 'favorable' incentives he can realistically hit. Looking at the Angels' primary competition in the American League West - I would think the Oakland Athletics can give Pedro a shot as well and give their rotation someone to immediately lean on while Justin Duchscherer is on the shelf. It maybe a good thing for Angels' fans, but the A's rotation seems thin or at least a rotation with no definite starters to jump on. Nomar Garciaparra c/o Oakland Athletics [spring training] - personalized and signed one card in black Sharpie. Maybe I wrote to him 10-12 years ago, but that possible request is long gone - if it was ever made. I remember getting him in-person during opening night for the Anaheim Angels in 1997, where he signed a baseball for me and my brother. I got him several years later in 2000, but Garciaparra started to sign less and didn't seem to be as accomodating. In 2008, I got Nomar in-person for the first time since 2000 - but I lost my autograph book with my Garciaparra set card signed. I was bummed out about that one, since the book also contained my Josh Hamilton [1999 Bowman Chrome] cards I'd expected to get signed. In 2009, I'm glad Garciaparra signed with a West Coast team - you figure he should be a little mellowed out and it won't be as difficult to get in-person, especially considering the number of times I maybe able to see him. I saw a recent Garciaparra success posted on this autograph forum I am a member of - found a random 2008 Upper Deck card [I'd 'relocated' my Garciaparra cards from sheets in a binder to a box] and sent a request ASAP. This request was mailed out on 3/21 and was received 3/28/09 - it was rather quick. I didn't care if it was personalized or in black Sharpie, but then I didn't send one of my set cards and the signed card I received looks pretty good to me. From this post, I received baseball uber prospect Matt Wieters, who signed an 8x10 photo for me - too bad the autograph had smudged to the point where sending to him had become a waste of time. I had to take an eraser in order to rub the autograph off the 8x10, which is still in decent shape. Since that last post, I also sent a few more spring training requests - which likely finishes the spring for me as far as requests go, though maybe I'll send a request or two to minor leaguers. 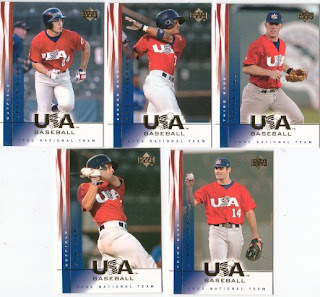 I picked up this 2002 Upper Deck Team USA National set for $25 - I bought this in-person at the 'psuedo card-show' set up at the MLBPA Arizona alumni game/Texas Rangers and Kansas City Royals' 'fan fest' during my spring training trip to Arizona. 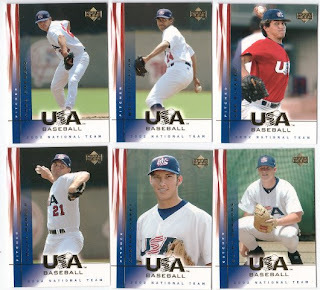 The lure of this box set are some of the alumni autographs - though I didn't get one I particularly liked and tried to highlight the cards in the boxed set of the 2002 USA Baseball National players who have played in the Major Leagues. Not pictured: Shane Costa and Rickie Weeks. Alumni autograph - Willie Bloomquist; I just about gagged when I pulled this, since I saw him on the field at Surprise Stadium, walking somewhere 10 minutes before I decided to pick up the box set. According to Dave and Adam's Web site - autographed cards include Ryan Howard, Mark Prior, James Loney, Joe Mauer, Jeff Francoeur, Matt Holliday, JJ Hardy, Bobby Crosby. You can only put in so much time collecting the rank-and-file guys and even some of the stars - sometimes you need something to keep you motivated besides seeing and getting certain players/team personnel. Depending on access and number of people who want the same thing as you do, trying to get anyone in particular can be nearly impossible - however, you are always hoping you get lucky. During my 2009 spring training trip, I was hoping to get this living legend to sign for me at a Texas Rangers/Kansas City Royals game in Surprise - I didn't even focus on the players leaving the game in-between innings, since I was so focused on Nolan Ryan. "I'll forget everyone else for Nolan," I heard one guy say to his buddy who was at the same game I was - it is too bad they didn't wait for him, since the buddy thought it wasn't Ryan whom he saw. I only told the buddy where Ryan sat, behind the Rangers' coaches. 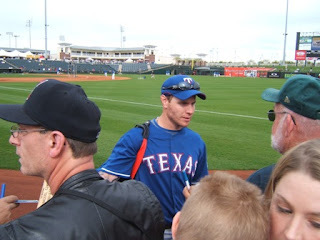 When Ryan signed after the game - I was pretty excited at the opportunity to be able to approach him for an autograph. The ushers at the game made sure a certain number of people were to approach. I bought the 8x10 photo either on Ebay or at a card show four years ago, hoping to get it signed by mailing it to Ryan's foundation. It was a Steiner Capture the Moment 8x10 matte photo - which shows Ryan pitching in his first no-hitter against the Kansas City Royals on May 15, 1973. It is safe to say - the 8x10 became the crown jewel of my 2009 Cactus League spring training trip. 2008 Topps Series 1 Target blaster with one three-card Target exclusive bonus pack [$4.99 each] - I was browsing through the blasters and briefly saw this for $4.99, marked down from $9.99. 2008 Topps was a 'meh' product - but who knows what I can pull from any unopened box of cards. I also like the feeling of busting any unopened box [even though it maybe no better than a 'fat pack'] for $5. Bonus pack - T-205 style retro design, according to this Cardboard Junkie post. #TCP 9 Joba Chamberlain - looks like someone pressed hard in the middle, leaving a crease. #107 Shawn Green - was this his last regular issue Topps card? #198 Shannon Stewart - Green and Stewart were the two up-and-comers in the Toronto Blue Jays' outfield towards the late 1990s, just a couple of seasons before the arrival of Vernon Wells. #93 Kenny Lofton - sometimes I think 1992 was just a few years ago, but reality says it was 17 years ago when a friend and I called a card shop to see what the value of a Lofton minor league card [out of a pack as opposed to a team set] was [apparently around $3 back then]. #72 Mike Piazza - this must have been my 'super veterans' pack; I don't realize how the years have flown by and how long someone like Green, Stewart, Lofton and Piazza had played professionally. #4 Rick Ankiel - - I'm not too impressed with the off-centered image and how Ankiel's face is sort of obscured. #127 Steve Pearce - was looking for a card of this guy in 2008 to get signed in-person. #C08-BO Barack Obama - candidates insert; the 'first' card of the leader of the free world would have been a more interesting pull when he was still on the campaign trail. #112 Jacque Jones - despite struggling to do anything in 2008, he has been a 'decent' Major League player; he was a 1996 U.S. Olympian and like Jenkins, went to USC. #252 Dmitri Young - battled through lots of personal problems; he and his brother were the showcase of a baseball documentary shown on the MLB Network. #MHR511 Mickey Mantle - home run card insert. #119 Jeremy Hermida - maybe some proof that careers of top prospects like Hermida are more up-and-down than meteoric. #104 Kevin Youkilis - points to a teammate who likely hit a home run; a hot dog vendor in the background claps his hand to celebrate as well. Youkilis seems like the toughest hitter to face on the Boston Red Sox, because the count seems like it is 2-0 once he steps up to bat. He fouls off a ton of pitches, works the count and BAM, he hits an extra-base hit or a home run. #FS 1 Kazuo Uzuki - if he actually existed, would he be on Japan's World Baseball Classic roster? Joey Votto c/o Cincinnati Reds [spring training] - signed one card in blue Sharpie and kept the other [2008 Topps Updates and Highlights three home run highlight card]. The well has been dry, so it was nice to see any autograph success received in the mail. This request was mailed out on 2/17 and was received 3/20/09 - from this post, I'm still waiting on Joba Chamberlain, Austin Jackson, Shawn Johnson and Kenshin Kawakami. 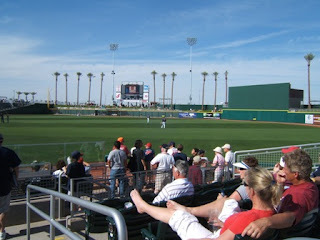 I did send out another batch of spring training requests - hopefully I've crossed all the t's and dotted the i's. This is the body of a 'fan-letter' I wrote to Vladimir Guerrero when he was still signing autographs through the mail back in 2000 - you can run, hit and hit a ton. You have one of the best swings in baseball, but it is frustrating as one of your fans to watch you struggle in the field as one of the worst outfielders in baseball, execution wise. With your quick wrists, it is easy to see why you are a great young player of the game. But even with a strong and deadly cannon for an arm, your instincts in the outfield are something to look with intent to improve. Hopefully you can develop better instincts in the outfield. You are too great of a young player to let that part of your game slip. I found a bunch of saved Word documents on Yahoo! Briefcase, I quickly went over and promptly deleted - I saved a few 'examples' for my archives, but looking back at the letter I sent to Vlad, I don't know if what I wrote to him was entirely accurate - or even if it made sense. I had asked for my two cards to be signed, though I don't know if I got particular cards from this request back. He just happens to be my favorite player [if nothing else, just to watch] today - back in 2000, he was probably just one of these rising stars who still signed through-the-mail on a somewhat regular basis. He probably stopped in 2001 or 2002 and is virtually impossible to get in-person unless it is an organized event where he is mandated to sign. 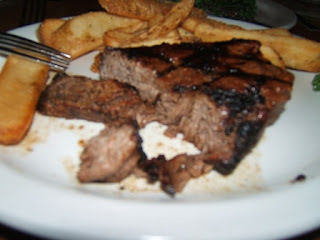 In the process of cutting up my steak dinner from some chain restaurant in Peoria. 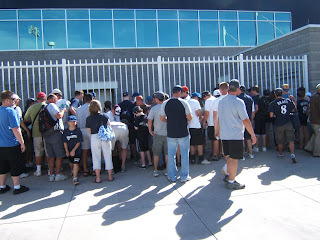 The crowd waiting for autographs swells up during the Milwaukee Brewers/Los Angeles Angels game at Maryvale. There is a corner down along right field at Goodyear Stadium where you can 'go down' and ask for autographs from Cleveland Indians' players leaving the game in-between innings. Once the game starts over, you have to go back to your seats. 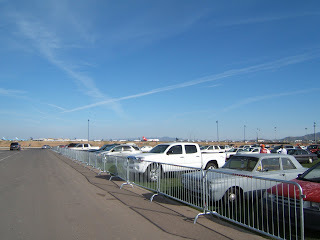 From the makeshift parking lot at Goodyear Stadium, you can see rows of what looks to be mothballed commercial airplanes in the distance. At Surprise Stadium, the poor guy on the left with the bat was being grilled by Josh Hamilton because Hamilton thinks he already signed for the guy. This image was taken the day Jason Giambi reported to Oakland Athletics' camp. A good number of people from the media wanted to get some time with him. He must have spent 40 minutes signing autographs after he was done with practice. 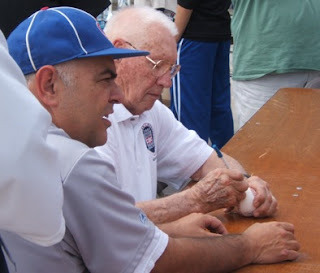 Everyone supposedly has his autograph, but 90-year old Bob Feller is a marvel when it comes to signing autographs. This image was taken in Surprise, where he threw out the first pitch at the MLBPA Arizona alumni game. He signed autographs from about 1:00-4:00 p.m. and hopefully he is still around and kicking for some time. He has a little table during Indians' games at Goodyear Stadium, where he signs a photo [he provides] and takes a picture with you for $10. The obscured player signing at Scottsdale Stadium is 2008 National League All-Star Brian Wilson of the San Francisco Giants. It gets crazy sometimes getting autographs at Scottsdale, because I believe it is the only facility where you can go to in the morning as players' drive in [name any decent San Francisco Giants' player and either they go through the door furthest away from fans and/or they sign in the afternoon] and the 'small' space where you can stand along the railing as players walk up can get congested and unruly. As far as this spring is concerned, Buster Posey, the No. 5 overall pick by the Giants still has to park on the minor league side of the parking lot and thus can still be approached without a railing separating him and the fans. San Francisco Giants' non-roster invitee Justin Miller signs autographs and is always interesting to look at because of the 'ink' he sports. Three or four years ago, I think it was ESPN the Magazine that featured a 'centerfold' detailing many of Miller's 'tats' and piercings. 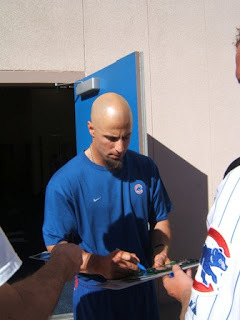 Chicago Cubs' outfielder Reed Johnson signing autographs outside the Cubs' weight room at HoHoKam park during a Cubs game vs. the Los Angeles Dodgers. Seattle Mariners bullpen coach John Wetteland stopping just outside the Mariners' complex in Peoria to sign autographs out of his Lambo. 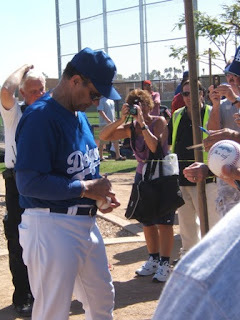 Dodgers Manager Joe Torre obliges fans and signs autographs after a practice at Camelback Ranch. 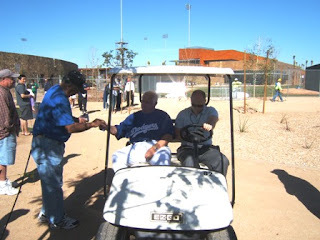 Former Dodgers Manager Tommy Lasorda can be nasty as far as his attitude about signing random autographs are concerned, but he is pretty much making the rounds and signing for those who want his autograph. 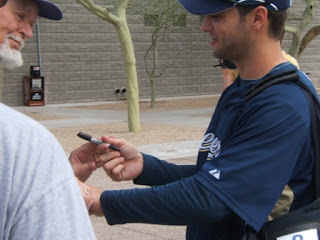 Milwaukee Brewers' outfielder Ryan Braun looks he is about to sign an autograph for a fan after practice in Maryvale. For a young superstar, he seems to still be accomodating as far as signing autographs, taking pictures and interacting with fans. So I picked up six packs of 2009 Topps Heritage at the local Target [$2.99 x6] - I heard the rumblings these are already out, so as much I'd thought about staying away, I was swayed by my curiosity. Several chews and about a couple of minutes later - the taste lifespan of one piece of pink gum is spent. #381 Atlanta Braves team card - checklist; an apparent problem I have with 2009 Topps Heritage is there are ink 'speckles' on some of the cards. Is this a desired effect to mimic the originals or just careless print defects? I'll go with the latter. #213 Manny Acta - the manager cards have taken on a life on its own and it seems like Topps has made a way to find cards like this palatable. The banner with the team logo infront is unique and the back isn't stats and facts, but a cartoon. #426 Scott Rolen - gray back; apparently an SP. #228 Jeff Suppan - from the times I've seen him sign autographs in-person, he seems like a down-to-earth and reasonably easy to talk to guy, considering he is a professional athlete. #NAP 6 Tim Lincecum - I want to jump on the guy's bandwagon, but nah. I do like Lincecum's MLB 2k9 video game commercial with his digital doppledanger being dressed down for his choice in music [Wang Chung: Dance Hall Days] and also by Randy Johnson in the locker room ["He should put a towel on"]. #NF-3 Weather Satellite Tiros-1 News Flashback insert - love how they put an old-school illustration of the first weather satellite. #TME-HR Hanley Ramirez - Mayo insert; one reason I wanted to bust these packs is I saw scans of Mayo inserts from this blog: A Cardboard Problem. #331 Troy Glaus - it seems like a long time ago, since he starred with the Angels [HR title in 2000, WS MVP in 2002]. #358 Yuniesky Betancourt - a reasonably competent Major League player, statheads don't like him because without getting a hit, he doesn't get on-base more and is more of a contact-first guy who doesn't really hit for adequate power. Also there seems to be grumbling about his defensive value and how he maybe on the downside of his career at his listed age of 27. #308 Zack Greinke - annoying ink speckles; I think the ink from the back of one card rubs onto the front of the card following it. 1.) It seems like the Heritage series have come in 'full bloom' with all sorts of colors - unlike in recent years, when Heritage meant the coolness of a retro product baseball card product symbolized by dour, subdued and boring cards. 2.) The quality control with the ink speckles makes me wary of purchasing more packs and a box - it seems like you want to embrace a baseball card product, but then find warts dulling your enthusiasm. 3.) I'm really tempted to build a set of these cards, but I'm not a set builder in a sense I'm going to devote my time looking to complete a set of baseball cards over the course of the year - I'm sure I'll fish out my share of the regular [non-SP] cards here-and-there, especially when looking for specific players' cards to get signed in-person/through the mail. 4.) I never thought any manager/coaches' cards would be worth my time - however, Topps did a pretty good job in making them appealing in this Heritage product. Naturally, I do like the managers' cards more than the floating heads coaches' cards. 5.) Topps did a good job in capturing some of the off-season moves, picturing some old and young faces in new places - albeit through the magic of Photoshop. 6.) The card backs retain a retro-quality, while still being easy to read - the cartoon images are always a nice touch and you get a short list of season highlights. The fact the backs feature only particular player's stats from last season and his career totals underscores the idea [ironically, in a retro product] we are in the age of the Internet, with Baseball - reference just a click away. Koji Uehara c/o Baltimore Orioles [spring training] - signed one card in black Sharpie. Andrew Cashner c/o Chicago Cubs [spring training] - signed two cards in black Sharpie. Cat Osterman c/o DePaul Softball - the softball star signed an 8x10 in black Sharpie. I didn't realize how dark the image was and the autograph shows up better in the scan. Each autograph success took about two weeks - I haven't mailed out as many through the mail autograph requests [particularly spring training] and from this post, I'm still waiting on Joba Chamberlain, Austin Jackson, Shawn Johnson, Kenshin Kawakami and Joey Votto [presumably back from the WBC].